The NASDAQ 100 Index is traded as the Powershares ETF QQQQ. QQQQ is up +3.35% for the week, down -4.69% for the month, up +2.58% for the year, and still up an amazing +82.32% since the March 9, 2009 market bottom. QQQQ, along with the Russell 2000 ETF "IWM", are leading market indicators. IWM and QQQQ have led the S&P 500 and Dow Jones Industrials 30 upwards since the March 2009 market bottom. The intermediate-term signal, the comparison of the 25 day and 50 day simple moving averages, signalled a bull market for QQQQ on March 15, which is still intact. That is, the 25d sma is greater than the 50d sma. The current closing price of 46.93, the higher yellow horizontal line, has pulled back from the April 23 YTD high of 50.52, a -7.11% or -3.59 decline. There are multiple levels of recent resistance above.. The benchmark price of 50.00 has had a lot of price interaction as short, intermediate, and long term resistance. There are multiple levels of support below, and there appears to be some recent support from November and December 2009 from about 22.22 to 22.42. There is also long-term support from the August, 2008 price peaking and decline, where QQQQ is trading presently. However, with the recent price volatility, support may be tenuous. QQQQ is below the 25 day and 50 day simple moving averages and closed just above the 100d sma on Friday, May 14. The 25d sma is now descending, even though the other sma's are still ascending. 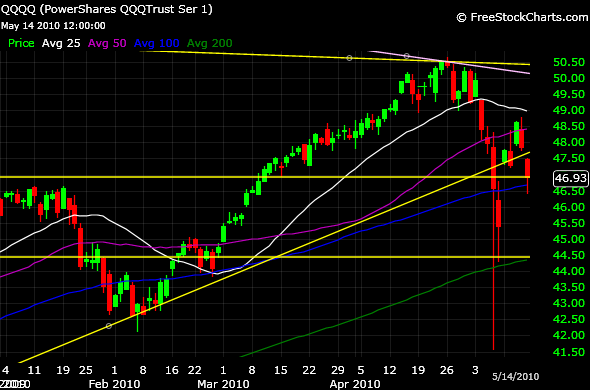 QQQQ has remained above the 200d sma since May 18, 2009. The yellow uptrend line, a rate of price ascent, is from the March 9. 2009 closing low of 25.74 up through the February 4, 2010 closing low of 42.62. The February 4 closing low was the bottom of the previous 2010 pullback. QQQQ plunged downwards through this uptrend line on Flash Crash Thursday, May 7. QQQQ closed below yet again on Friday, May 14. The yellow downtrend line, a rate of price descent, is from the October 31, 2007 peak closing high of 55.03 down through the April 23, 2010 closing high of 50.52, the peak YTD closing high so far. QQQQ is below this downtrend line. The lavender downtrend line, a rate of price descent, is from the March 27, 2000 all-time adjusted closing high of 114.30. QQQQ is below this downtrend line. The MACD has been bearish since April 27, but is uptrending. The lower yellow horizontal line is the 10 month exponential moving average from the monthly chart, which I have overlayed on this daily chart. That is the line in the sand, so to speak, for the long term signal of a bear market. QQQQ is above this signal at the current close, the higher yellow horizontal line. QQQQ set a 2010 YTD high on April 23 and then was pulled down by the overall market downdraft. The overall market has been volatile, so high beta QQQQ is bouncing up and down accordingly. The technology sector Q1 revenues, earnings, and outlook have been very good. I remain bullish on QQQQ in 2010 and still predict there will be more 2010 YTD highs. The RSI 14d & 28d indicate marginally oversold conditions. The MACD is bearish as a result of the general market pullback. The intermediate-term trend and long-term trend remain bullish. The NASDAQ 100 Index includes 100 of the largest domestic and international nonfinancial companies listed on the Nasdaq Stock Market based on market capitalization. The QQQQ will, under most circumstances consist of all the stocks in the Index. 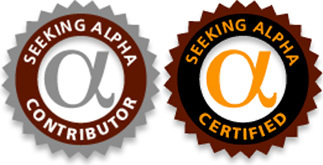 The QQQQ portfolio is rebalanced quarterly and reconstituted annually.. The Powershares QQQQ portfolio holdings are here. QQQQ is heavily weighted to the Information Technology sector (62.70%), then Health Care (15.22%), then Consumer Discretionary (15.02%). Those 3 sectors comprise 92.94% of the entire portfolio. Therefore, the QQQQ is a tech weighted, nonfinancial Index and related ETF. Also, Apple Inc., AAPL, is the most heavily weighted stock in QQQQ at 18.29% and is reviewed in detail here.